A calendar is a system of measuring the passage of time for the purpose of recording historic events and arranging future plans. Units of time are defined by three different types of motion: a day is one rotation of Earth around its axis; a month is one revolution of the Moon around Earth; and a year is one revolution of Earth around the Sun. The year is the most important time unit in most calendars, since the cycle of seasons repeat in a yearly cycle as Earth revolves around the Sun. Making a yearly calendar, however, is no simple task because these periods of time do not divide evenly into one another. For instance, the Moon completes its orbit around Earth (a lunar month) in 29.5 days. A lunar year (12 lunar months) equals 365 days, 8 hours, and 48 minutes. A solar year (time it takes Earth to complete its orbit around the Sun) is 365.242199 days, or 365 days, 5 hours, 48 minutes, and 46 seconds. The calendar we currently use is adjusted to account for the extra fraction of a day in each year. The official calendar currently used worldwide is the Gregorian calendar. The ancient Egyptians adopted a 365-day calendar sometime between 4000 and 3000 B.C. The first major improvement to that 365-day calendar was made by Roman dictator Julius Caesar (100–44 B.C. ) in 46 B.C. With the help of Greek astronomer Sosigenes, Caesar developed a calendar divided into 12 months of 30 and 31 days, with the exception of 29 days in February. In this new Julian calendar (named after Caesar), an extra day, or leap day, was added to every fourth year to account for the 365.25-day solar year. The Julian calendar, however, was still off by 11 minutes and 14 seconds each year. Over 300 years, this difference added up to just over 3 days. 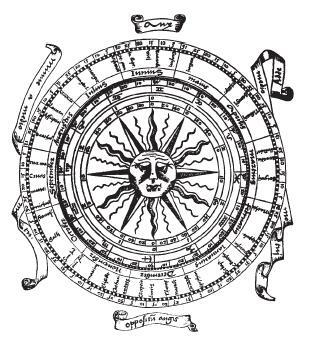 By the mid-1500s, the Julian calendar was another 10 days ahead of Earth's natural yearly cycle. To adjust this calendar to line up with the seasons, Pope Gregory XIII (1502–1585) introduced another change in 1582. He first ordered that 10 days be cut from the current year, so that October 4, 1582, was followed by October 15, 1582. He then devised a system whereby three days are dropped every four centuries. Under the original Julian calendar, every century year (200, 300, 400, etc.) was a leap year. In the new calendar, named the Gregorian calendar, only those century years divisible by 400 (800, 1200, 1600, etc.) are leap years. Although not perfect, the Gregorian calendar is accurate to within 0.000301 days (26 seconds) per year. At this rate, it will be off one day by about the year 5000. The Jewish calendar is a lunisolar calendar, a combination of lunar and solar years. The calendar is 12 lunar months long, with an additional month added every few years to keep the calendar in line with the seasons. The months (with corresponding days) are Tishri (30), Marheshvan (29 or 30), Kislev (29 or 30), Tebet (29), Sebat or Shebat (30), Adar (29), Nisan (30), Iyar (29), Sivan (30), Tammuz (29), Ab (30), and Elul (29). Adar II, the extra month, is added periodically after Adar. Calendar years vary from 353 to 355 days; leap years may have 383 to 385 days. Rosh ha-Shanah, the Jewish New Year, is observed on the first day of Tishri. (29 or 30). The first day of the first year of the Muslim calendar corresponds to July 16, 622, of the Gregorian calendar. Technically, the year 2000 on the Gregorian calendar was not the beginning of the third millennium (a 1,000-year span). In actuality, it was the last year of the second millennium. When the Gregorian calendar was adopted, the transition of the years B.C. to A.D. —marking the birth of Jesus of Nazareth—did not include the year 0. The sequence runs 2 B.C. , 1 B.C. , A.D. 1, A.D. 2, etc. According to this sequence, since there is no year zero, the first year of the first millennium was A.D. 1. Thus, the first day of the third millennium was January 1, 2001. Although the Gregorian calendar allows for the oddity of Earth's orbit and for the dates when Earth is closest and farthest from the Sun, the shortness of February introduces slight problems into daily life. For example, a person usually pays the same amount of rent for the 28 days of February as is paid for the 31 days of March. Also, the same date falls on different days of the week in different years. These and other examples have led to several suggestions for calendar reform. Perhaps the best suggestion for a new calendar is the World Calendar, recommended by the Association for World Calendar Reform. This calendar is divided into four equal quarters that are 91 days (13 weeks) long. Each quarter begins on a Sunday on January 1, April 1, July 1, and October 1. These 4 months are each 31 days long; the remaining 8 months all have 30 days. The last day of the year, a World Holiday (W-Day), comes after December 30 (Saturday) and before January 1 (Sunday) of the new year. W-Day is the 365th day of ordinary years and the 366th day of leap years. The extra day in leap years would appear as a second World Holiday (Leap year or L-Day) between June 30 (Saturday) and July 1 (Sunday). The Gregorian calendar rules for ordinary, leap, century, and non-century years would remain unchanged for the foreseeable future. What year is this according to the Jews? It not important but I would like to know aqnyhow. Is this enough copy to get man answer?